Yamaha Golf Cars of the Virginias has been a Yamaha golf car distributor since the fall of 2007. We sell and service all makes and models of golf carts, and have happy customers from Ruckersville, Charlottesville, Staunton, Fredericksburg, Virginia Beach, Newport News, Norfolk, Richmond, Hampton Roads, Roanoke, Martinsburg, West Virginia, and throughout northern Virginia. During this period we have sold and leased thousands of new, used, and reconditioned golf cars. We at Yamaha Golf Cars of the Virginias specialize in providing our customers with only the best service, sales, and customization of golf and utility cars, as well as a full line of golf car parts and accessories. We are the name to trust for all of your golf car needs. Along with Yamaha, we offer a great variety of used golf carts as well. We offer Yamaha financing on both new and reconditioned golf and utility cars. Let our competitive rate programs put you in that new or reconditioned golf or utility car today. Our factory-trained technicians service Yamaha, Club Car, and E-Z-GO golf car models in both gas and electric. Bring yours in today and let us add that new accessory or perform a complete annual check so you are ready for the new season. Check our monthly specials on our Parts and Service page. We also stock a large inventory of golf car parts and accessories for immediate shipment. We have a variety of used parts that can save you money. We also stock many multi-fit and aftermarket parts for competitive models. If you need batteries make sure you call for our low prices with free installation. Look to Yamaha Golf Cars of the Virginias for all of your golf car needs. 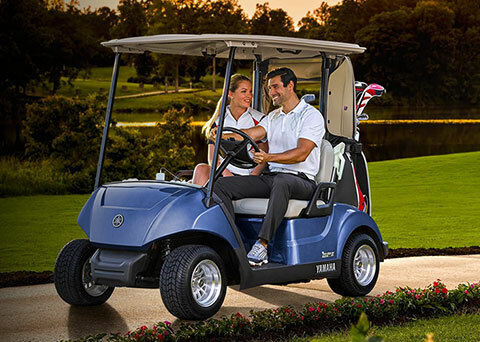 We are Yamaha's only authorized distributor of golf and utility vehicles located in Virginia. We carry new, used, reconditioned, and custom golf cars and utility cars. We are located near the intersection of Route 29 and Route 33 in Ruckersville. Please call 434-990-0157 for information or email us at info@yamahagcva.com.